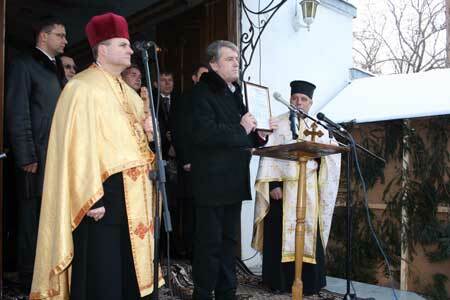 On 4 January 2010, attended the fourth Ukrainian President Viktor Yushchenko, the diocese and city Buchach (Buchach) and handed it back to sacred monuments of art as the works of local artists' brushes parish church. This was part of the iconostasis - diaconal door - the Church of the Holy Protection in the city Buchach. "We not only supply our churches that we should return our faith," said our spirit "- united by the President and pointed to the role of churches in the formation of an independent Ukrainian state. During the ceremony (with the concomitant transfer of prayer) President also highlighted the role of the Greek Catholic Church in the spiritual development and material support for the Ukrainian population and development in Ukraine. President of Ukraine met with the Apostolic Administrator of the Diocese Buchach Reverend Dmitro Hryhorak, OSBM and the minister Volodymyr saffron. Viktor Yushchenko together with the clergy laid flowers at the graves of victims of the churchyard of the totalitarian regime, whose remains were found in 1991 m in the church basement of the church of St. Buchach.